Social strategist Lauren Gibbs is calling on Facebook CEO Mark Zuckerberg to take a stand against the social media censorship of cannabis businesses and consumers. Perhaps this has happened to you: You wake up one morning, make your coffee, and log onto your social media accounts, only to find that you no longer have an Instagram feed. You try to login a few more times, on the chance that you’ve incorrectly input your password or the app was experiencing a glitch. Still no luck. So you begin to come to terms with the fact that you’ve been shut down, that while you were sleeping someone in the internet ether revoked your ability to connect and communicate, that all of your photos, followers, and likes are gone. Seemingly at random, social media platforms are disabling accounts that contain cannabis content, many of which belong to state legal cannabis businesses and consumers in legal states. In addition to serving as an outlet for free speech, social media plays a fundamental role in the lives of these companies and individuals: driving sales, creating community, pushing activism, and ensuring safe access to medicine. When an account is deactivated, time, money, and important connections are lost. As the pace of these shutdowns surges, one social media guru vowed not to stand by and wait for it to happen to her. 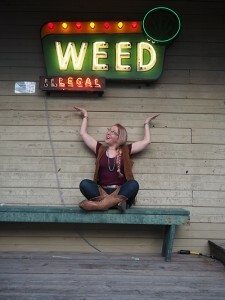 On 4/20, Rise Above Social founder Lauren Gibbs, who has directed social content for companies such as Women Grow and Willie’s Reserve, published an imposing and impressive open letter to Facebook founder Mark Zuckerberg on The Cannabist. She applauded Zuck’s commitment to connecting humanity through social media and pressed him to respect the freedom of expression of cannabis-related accounts and to grant cannabis companies the same advertising terms, with age restrictions and geo-tracking that serve alcohol companies. Zuckerberg, Gibbs noted, has been an outspoken critic of the racist war on drugs and could use this as an opportunity to lend his voice to dismantle it. In the weeks following, her op-ed gained tons of traction on Facebook, but she had yet to hear from its CEO. Gibbs decided to turn the screws a bit. 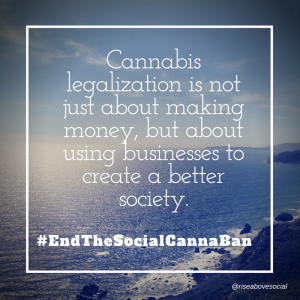 Earlier this month, she launched the #EndtheSocialCannaBan campaign, organizing and rallying others in the cannabis space to flood social media with memes that demonstrate the significance of this movement and the groundswell of support behind this mission. We got the lowdown on the campaign from Gibbs, who wouldn’t stop working to #EndtheSocialCannaBan, even as she was bedbound with bronchitis. WRK: What motivated you to launch the campaign? 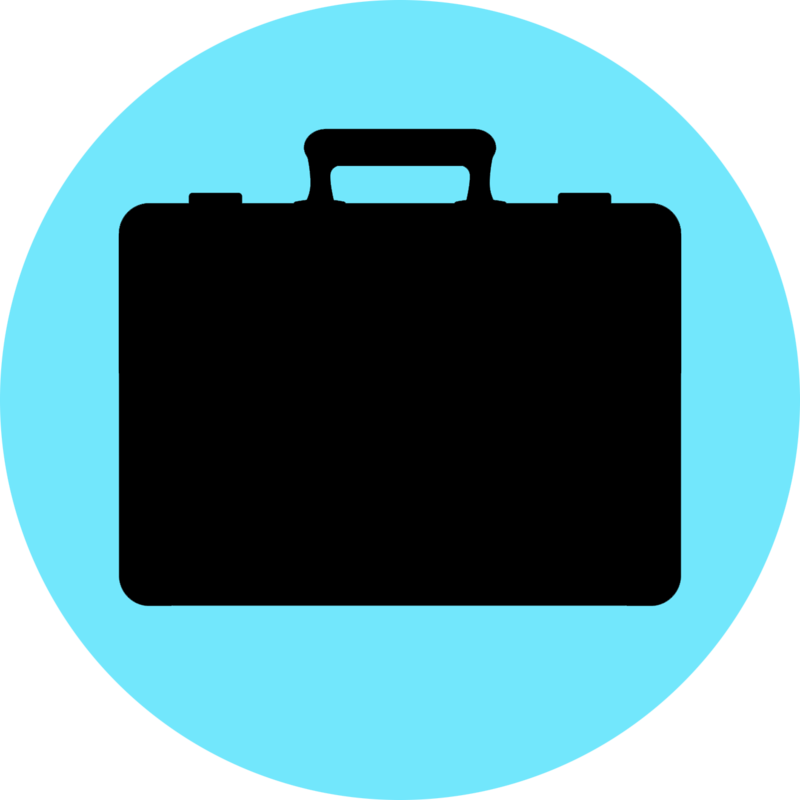 Did you see a particular strategic opportunity or had you simply had enough? LG: Over the past two years, I have participated in the explosive growth of the legal cannabis industry. I have seen firsthand how legitimate businesses have become a powerful force in changing perceptions, and laws. Meanwhile, arbitrary shut downs of social media accounts and limitations on advertising severely limit our voices – and the pace of progress. There have been a number of media reports about shutdowns, and occasionally I would see a knee jerk petition launched. But nothing was changing. It became clear that the industry needed an organizing force behind this effort for us to be heard by Facebook and Instagram. Mark Zuckerberg has been outspoken about two relevant issues: the racial bias of the drug war, and the power of community building to bring positive change. But his companies serve to reinforce the status quo of the drug war. I had to call him out it. WRK: What’s your ideal outcome? How likely is that you’ll achieve this goal? LG: I would like to see Facebook and Instagram adapt their terms of service to accommodate cannabis businesses that are operating within the laws of their states. I simply want access to the same geo-targeting and age restriction technology that alcohol companies use to advertise their products in compliance with local laws. Plenty of tech companies are already quietly bucking the status quo of the drug war every day to work with cannabis businesses. I want to see Zuckerberg lead on this issue. Optimism and tenacity are job requirements for success in the cannabis industry. I cannot promise a specific outcome, but I am determined to get @Zuck’s attention. WRK: What level of support have you received from the cannabis industry? LG: After launching the campaign, my inbox was flooded with notes of gratitude from my peers in the cannabis industry. 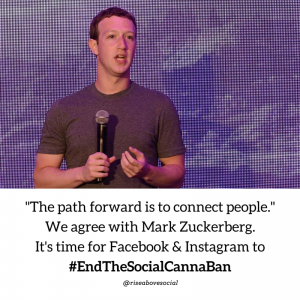 My open letter to Zuckerberg has been shared over 4,000 times on Facebook, and in the first week of the campaign, over 1,000 cannabis business supporters have shared my memes designed to spread the word. Leafly published Jane West’s op-ed in support of #EndTheSocialCannaBan, and The Kind featured the campaign as well. WRK: How can others get involved with the campaign? LG: This is the beauty of social media – everyone can easily get involved! If you are sick of seeing cannabis social media accounts shut down capriciously, join us in making some noise! 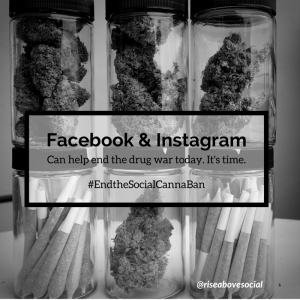 Everyone can participate on Facebook, Instagram, and Twitter by using the hashtag #EndTheSocialCannaBan. We have created graphics to help you spread the word more powerfully, and will be releasing new ones every week. Every single share counts! 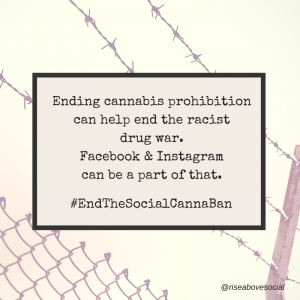 Remember – always use the hashtag #EndTheSocialCannaBan! 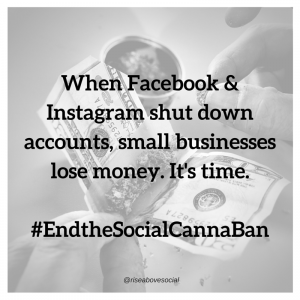 Posted in Features, Out of the Basement and tagged #EndtheSocialCannaBan, cannabis, cannabis industry, Facebook, Instagram, lauren gibbs, Mark Zuckerberg, Rise Above Social, social media, Twitter, Willie's Reserve, women grow, Zuck.